Drop In Hours: at Tiny Tots Baby Boutique and by appointment on other days. 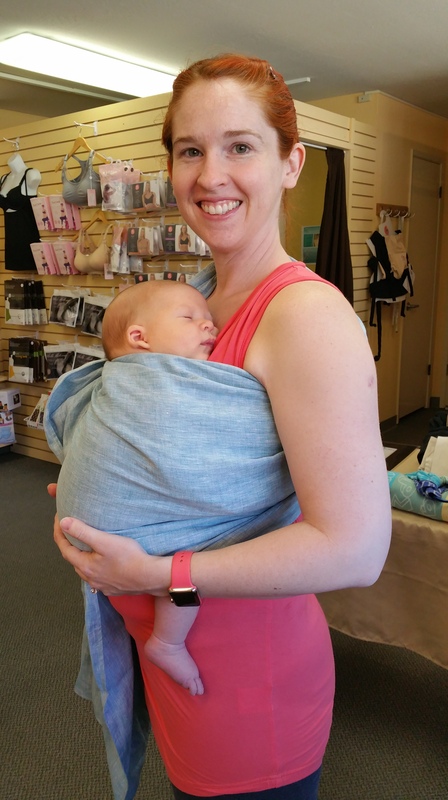 Check out the selection of carriers at Tiny Tots, and have an informed Babywearing Consultant help you to find a carrier that will suit your needs and be the most comfortable for you. You will go home confident with your new carrier purchase. Already have a carrier you need help with? We can fit it to you and your baby, and troubleshoot any comfort issues you may be having. This session is also a great option for hands-on help with learning a new carry with a carrier you already use and love. If you need help with more than one carrier, up to two sessions can be purchased in a row. If you feel like need a little more than that, check out a Private Consultation! Bring your personal carrier, or try many different carriers from our extensive library to get an idea what works for you. Hands-on help with proper positioning and use, recommendations for carriers that will suit your personal taste, demonstrations, and reference sheets to bring home with you, are just a handful of the many things that can be included in your personalized consultation. 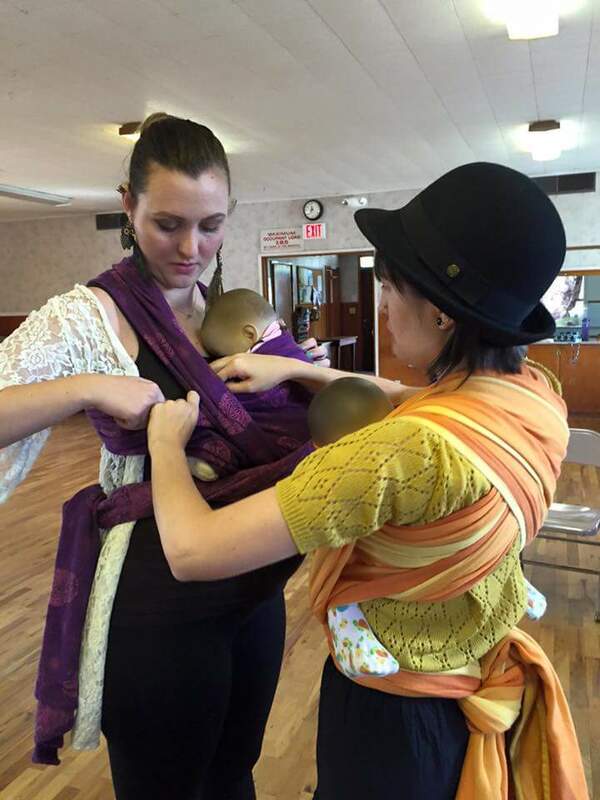 After booking a session, a Certified Babywearing Consultant will contact you with some questions to make your consultation something you will be thrilled with. This is a great gift for a baby shower or an expectant friend or family member. This is a wonderful alternative for those who benefit from learning in a one-on-one environment. This session includes follow up with your consultant via email or phone, and a gift certificate for $10 off a single carrier of your choice at Tiny Tots. Proud Parents – to- be practicing their wrapping skills. Getting out of the house with a new baby can be tough! Or maybe you have a few kids and can’t wrangle them all to a consult. No problem! We can come to you! 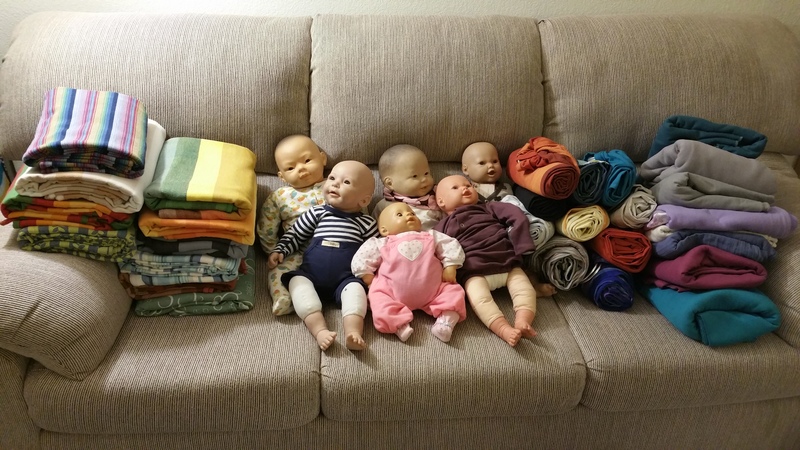 We will bring an extensive carrier stash and a weighted demo doll and tailor a session to your personal needs. If you already have a carrier and just need some help with proper positioning and use, we can do that too! This session is ideal if you have a NICU Graduate, special needs, or a bag full of hand-me-down carriers you want to make the most out of. 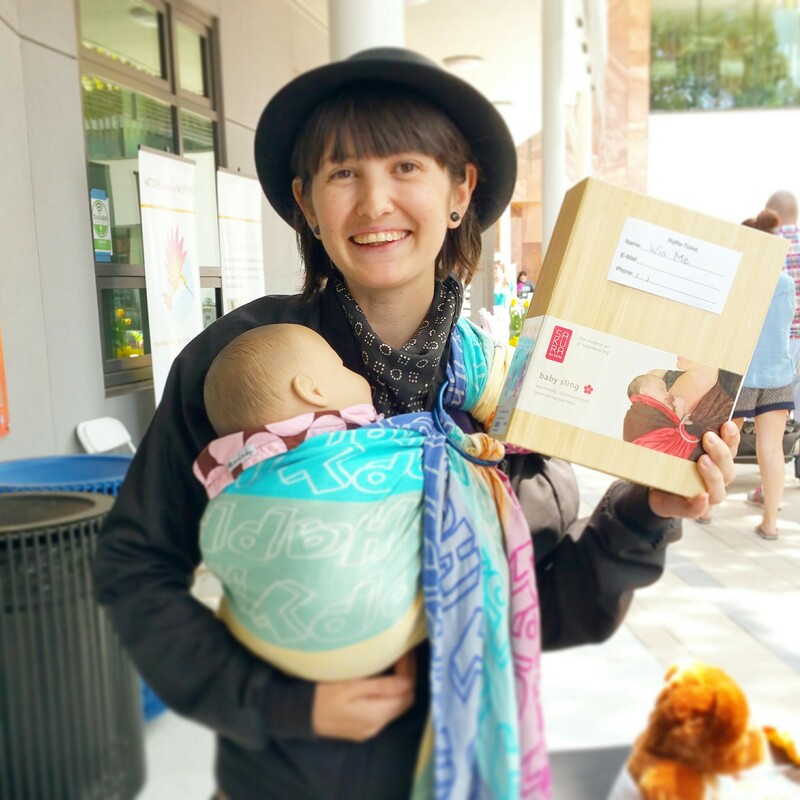 After booking a session, a Certified Babywearing Consultant will contact you with some questions to make your consultation something you will be thrilled with. Invite a couple of friends and make it a party – group discounts are available! This session includes follow up with your consultant via email or telephone, and a gift certificate for $10 off a single carrier of your choice at Tiny Tots. Email: modernbabywearing.info@gmail.com to schedule this series. Classes are held regularly at Tiny Tots in Campbell, California and occasionally at other venues. I am available to travel, and can cater classes to your needs. Group discounts are available. With hundreds of types on the market, which kind of carrier offers you and your baby the options that are important to you? Which carrier is the best carrier? Are some better for breastfeeding than others? Some may have heard myths regarding safety and proper hip and spine development in carriers, and want to know more about it. 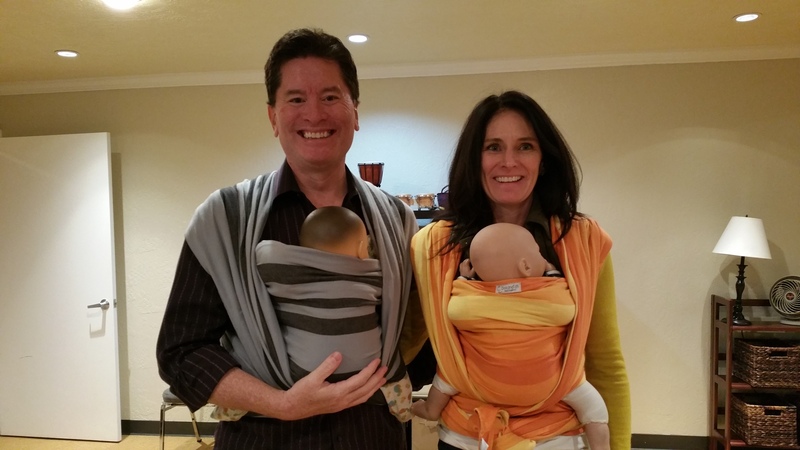 All these questions and more can be answered in this 90-minute session discussing 6 major carrier types available to help you carry your baby, and touching on some of the physical and emotional benefits to baby and caregiver that a carrier can facilitate. 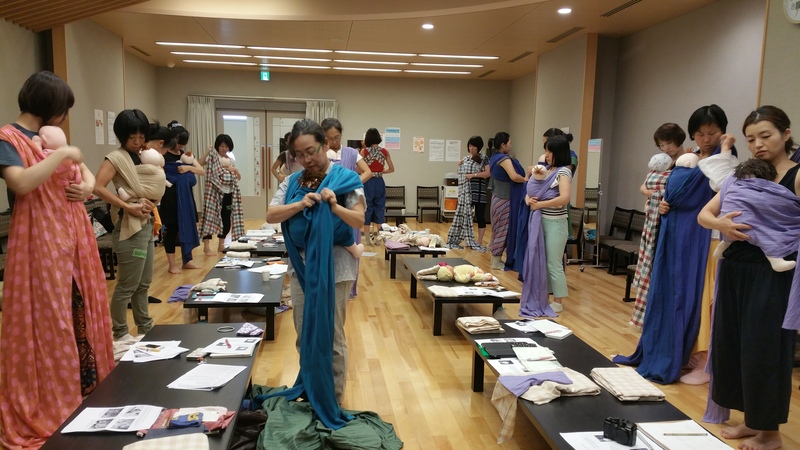 Carriers Discussed: Stretchy Wraps, Woven Wraps, Ring Slings, Meh Dai’s, Soft Structured Carriers, and Front Packs. Opportunity to get hands-on help with (at least) one carrier from our extensive library. For parents to be! This 3 Hour session is meant to be taken before the baby arrives. Our babies are born with a unique set of physiological needs, and instinctive reflexes to help get those needs met. In this session, we will discuss early infant development and bonding, reading infant cues, ways to encourage the optimal growth conditions for your newborn baby, and how we can use this knowledge of Kangaroo Care and babywearing to get breastfeeding off to a great start. *Significant discounts available to Non-Profit groups or For-Profit groups working with vulnerable populations. Please email me. This 2-day workshop is intended for those who are working as Prenatal and Postpartum educators. It is aimed at improving your skill set with woven wraps, and increasing your ability to teach wrapping through better understanding of wrap mechanics, and demystifying wrapping terminology. We will cover a series of front, hip, and back carries with both a short and long wrap – leading up to fancy finishes at the end of the second day. You will leave feeling confident in your wrapping skills, and your ability to teach wrapping. No prior woven wrap experience is necessary. This class will give you the confidence to support your clients with their baby carrier needs during the 4th Trimester. 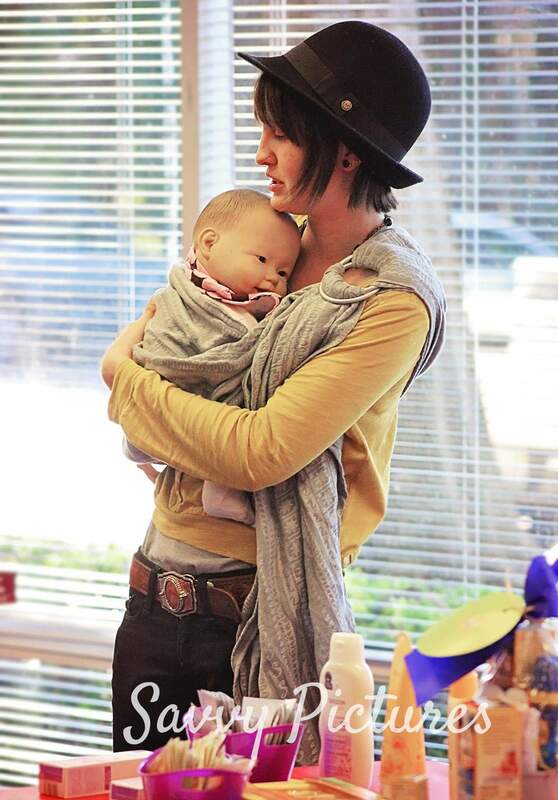 This class is suited for Doulas, Midwives, Lactation Consultants, Breastfeeding Peer Counselors, and more. This is a small class with ample opportunity for hands-on practice. 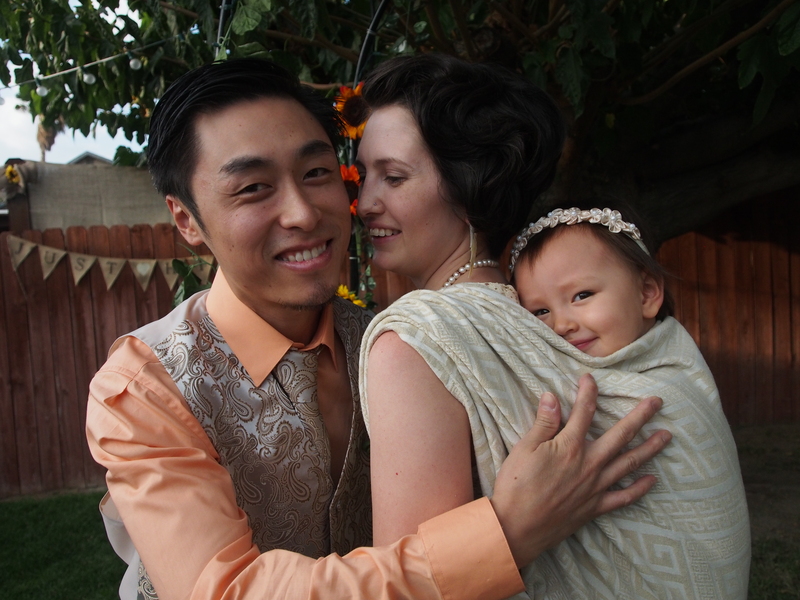 Are you a family planning a portrait shoot with your legacy wrap? Have a special carrier that you hope to have as the centerpiece of your newborn photos? Our photo consulting service can help you to make those photographs beautiful and memorable. We can plan a style around a specific carrier that you provide, or help you to find a wrap or ring sling that will tie it all together beautifully. We want your photos to be the modern marvels you’ve been seeing in your dreams. Going to a wedding? Black tie-affair? Birthday bash? Baby in tow could be a real drag on your fashion sensibilities – so why not include them in the styling? Let us help you find a carrier that will jive with the needs of your event, or teach a few fancy carries to dress up a simple wrap. Nothing to wear yet? Even better! Chat with us, we’ll help you find an outfit to suit your style – and showcase some ways to make your baby a part of the fun. Follow up via e-mail or Facebook is included in this service until your event has passed. 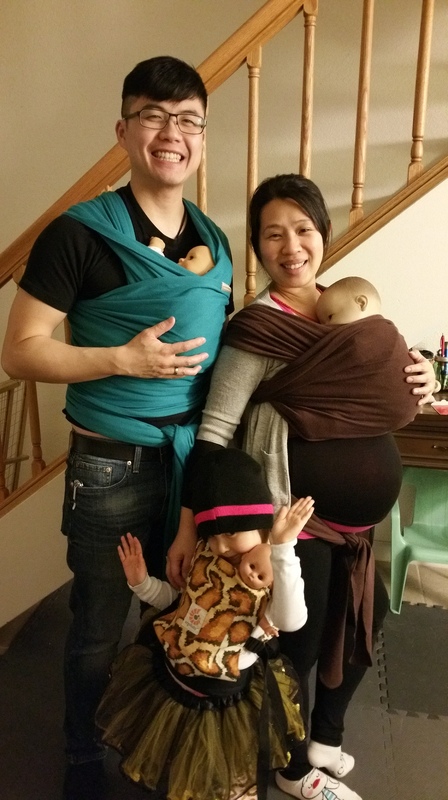 Are you a babywearing business looking to advertise a new product? Have a Certified Babywearing Consultant style your shoot! 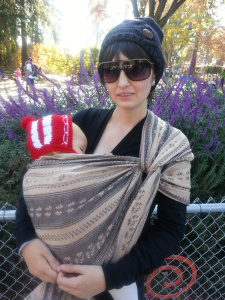 You can be sure to have a fashion-forward photo, with a carrier that is utilized safely and properly. Show your clients that you know what you are doing. A picture is worth a thousand words, so make sure you are saying what you mean to. Some package options include model styling in the weeks before the shoot, hands-on help for the duration of the shoot, showcasing proper positioning and use of the carrier and all its components, social media presence following the shoot. We work closely with a few different photographers, so if you are not already set on one – we can help with that too. All ready for a Doula Workshop!